Better late than never, my review of the Christie’s sale of African, Oceanic and North-American art on June 23th. In total this auction brought in € 11,5 million (premium included) – the total low and high estimate being € 9,6 – 14,8 million. Without the premium, the sale total was € 9,9 million, and thus still above the low estimate. The sale was sold 78 % by lot (78 out of 100 lots, so that was an easy calculation). Including the premium, 45 % of the lots sold above the high estimate – without the premium that would only be 24 %. When not taking into account that commission, 52 % of the sold objects did so under the low estimate. 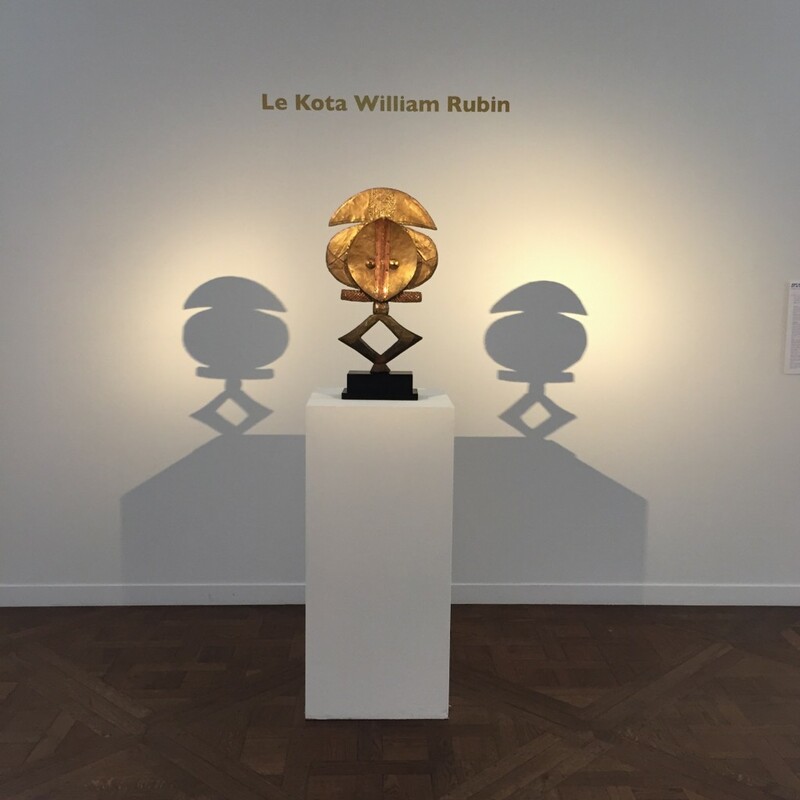 Leading the auction, and responsible for almost half the total sale result, was the highly anticipated William Rubin Kota: Ruby was sold for € 5,4 million (including the buyer’s premium) – making this work the most valuable work of African art ever to be sold at Christie’s France, the 2nd most important price achieved at auction for an African work of art sold in France, and 3rd in the world. The press release talked of 6 bidders, while I only spotted four: two on the phone and two in the room, one of them (a famous French movie producer) being the underbidder (who would later buy the other Kota (for only €16K) to surprise his wife). Personally I had expected more from Ruby (as stated here), as Christie’s had pushed out the boat with the marketing of its sale. Being flown around the world (as far as China) to attract new potential buyers for such a work, one had expected more bidders than the 6 Christie’s lists. However, not many people in the trade shared my enthusiasm about this Kota, and especially its estimate ($6-9 million), which was the same as Kunin’s Senufo statue. The high estimate of that figure however had a precedent, since it already had broken a world record the first time it came up at auction. For Ruby there were no such precedents and (apart from a few private sales in that region) only two times a Kota was sold a bit over the € 1 million mark. Anyhow, while Christie’s hopes for Ruby (as were mine) might have been too high, its sale result, while under the low estimate, remains remarkable. It must be said the auction room was packed and I had never before witnessed so much excitement during a sale (in my short career). An estimate of € 2-3 million might have been more correct, but the value of this icon was in the eye of the beholder. 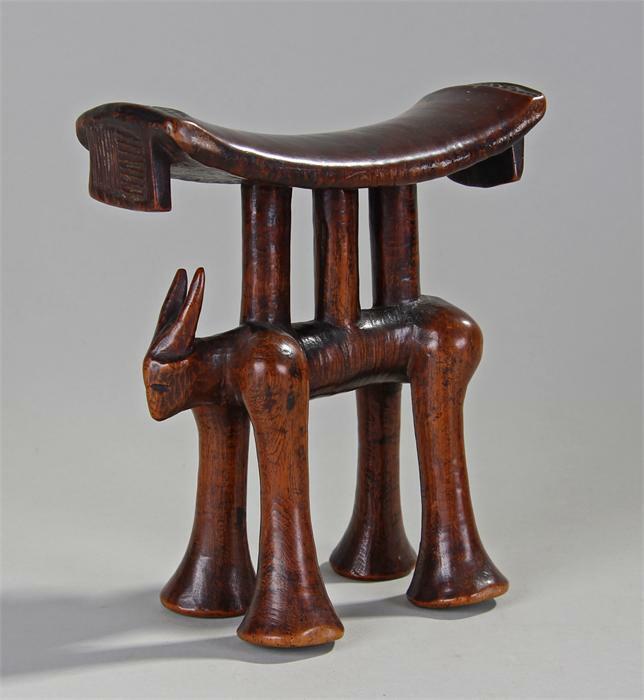 The auction had started on the right foot when the first lot, a great Bamana chiwara, ‘dans sons jus’, more than double its low estimate and sold for € 20,000. A first surprise was a nice Dan mask that sold for ten times its low estimate at € 20,000 after been the subject of a small bidding war. This mask in fact is not Dan, but Diomandé (a bit more to the North), as can be witnessed by the 2 x 3 scarification lines on the edge of its face. It still had the remnants of chewed kola nuts, which were spit on by its owner when the mask was no longer used as a runners’ mask. Collected by the Belgian botanist Jean Houzeau de Lehaie in 1934, it had an excellent provenance, and – apart from the damaged lower lip (which according to some made it less commercial) – was a fantastic example of its kind. A personal favorite was the Ijo mask, lot 13, which sold under its low estimate for only € 5,625 – a bargain for a mask of this quality and prove that the art of this region still remains largely under appreciated. A rare and ancient beaded Yoruba cap did well, selling for € 17,500, while the other works in this group of Yoruba beadwork did not that great. Lot 33 was a great Bamun buffalo mask, in fact one of the better of its kind still in private hands, which sold for € 43,500 (while definitely being worth more). Next up was a group of objects from the Verité sale. I will dedicated a separate blog post to the heddle pulleys. 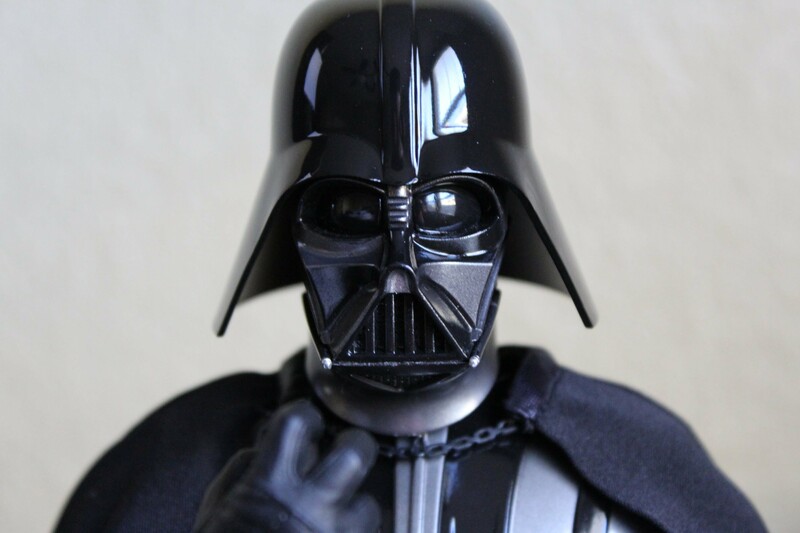 The Grebo mask broke the world record and was sold for more than double its low estimate at € 1,3 million (almost doubling the result of the Verité sale) and the famous Verité Baga shoulder mask ( info) sold just under the high estimate to a telephone bidder for € 2,4 million. In 2006 it was sold for € 2,2 million, which now would be € 2,5 million – so if you do the math, the consignor annually lost 3,5 % on it. Not a great investment thus, but it could have been much worse; the Verité result itself at the time was already considered too high. A bit later, the newly discovered Boa mask was sold just under the low estimate at € 97,5K – in my view the facial planes could have been a bit more angular, but the back of the mask did look very good. A personal favorite was the Metoko figure (lot 70). Estimated much too low at € 25-35K, it was bought by a Parisian dealer for € 121,500, which didn’t surprise me since it’s not only rare but also a hell of a sculpture. Notwithstanding the market for ivory being dead in the US, the next three ivories did very well: a rare Hungana ivory figure, est. € 8-12K, was hammered down for € 71K, a rare Songye hair pin (est. 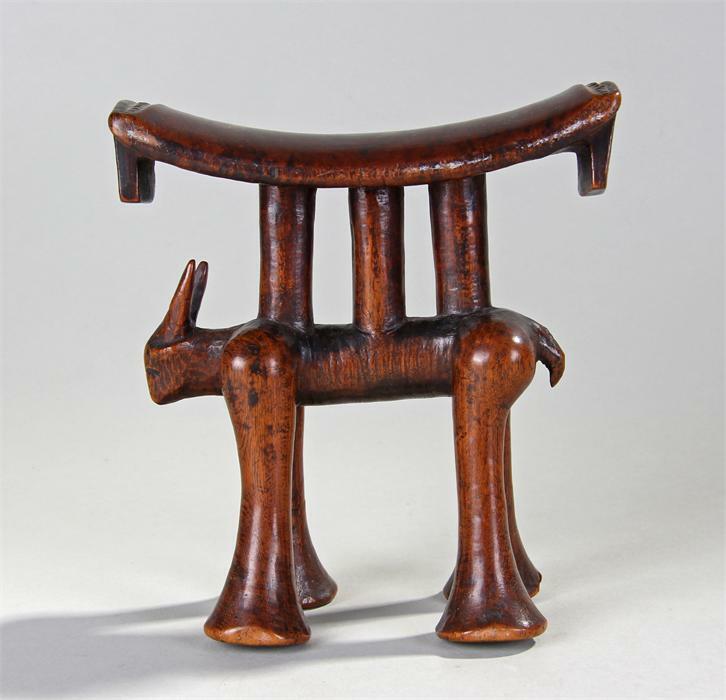 € 3-5K) sold for € 21K (info) and a Pende ikhoko was almost sold 100 times the low estimate (!) for € 133,500. Post-sale, this record price was probably even more discussed than the Kota. 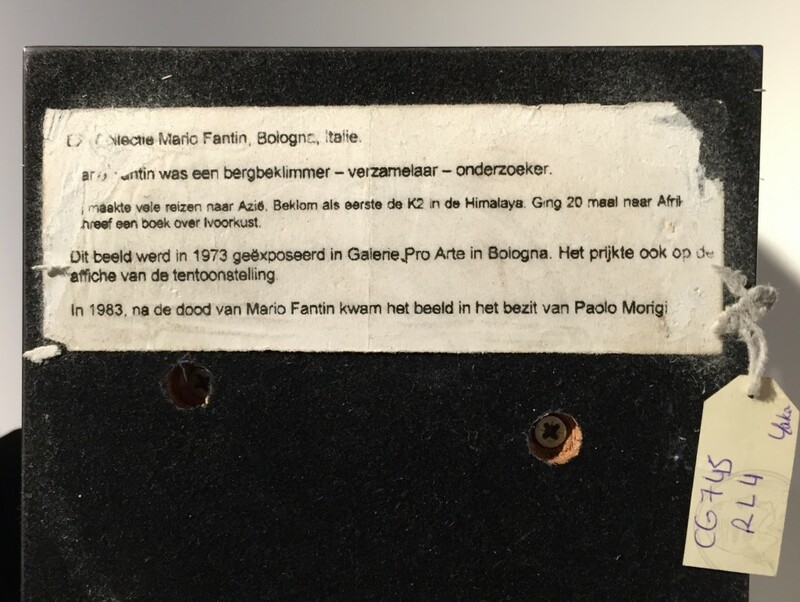 It’s a good example of what can happen at auction when two interested parties (with deep pockets) want one and the same object and are prepared to go deep – as my mentor Guy van Rijn always used to tell me: it takes two to tango. This result is a record price, of course, does not really reflect the real market value. The Belgian Royal Museum for Central Africa holds a (much more worn) example from the same artist (EO.0.0.32155) by the way. Being a great example (with a smiling mouth, which is unique and only found on the works of this master), this pendant was clearly worth more and the estimate was of course too low – even I had considered bidding on it, but it became clear quickly that there was a massive interest in this little gem. When the auctioneer passed the €20K mark, bidding continued between a telephone bidder and a Belgian collector accompanied by a dealer and with each new bid the buzz in the room only increased. Not much later, a standard Suku helmet was bought by a Belgian dealer for € 97,5K (est. €15-25K). Another surprise, at least for some, was the result of lot 76, a superb Yaka figure that sold for more than four times its low estimate at €43,5K. I have written about it before here. 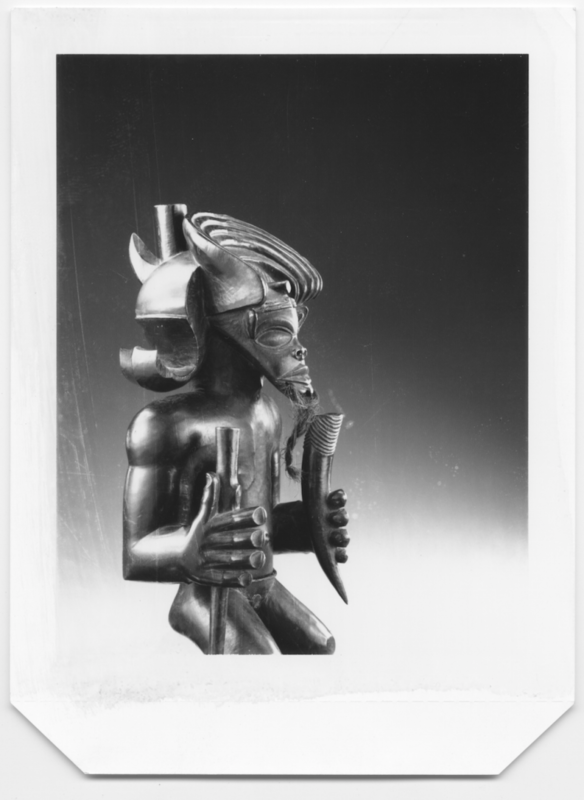 As for the unsold lots, especially the Kerchache Jukun figure (lot 19) is notable. Although Christie’s spend four pages in the catalog to praise it and had been advertising for several months, it failed to attract a single bid starting at € 120K (while being estimated € 200-300K). The auctioneer must have known there was zero interest pre-sale, since he passed the lot in less than 30 seconds, leaving many in the room flabbergasted. It was the general feeling that had he waited longer, he certainly had been able to extract at least a few bids. Not surprisingly, there was a lot of interest in the after sale. Although one eye is restored, it is certainly a museum-quality object with a great provenance. Perhaps, many were still dreaming about the other, even better, Jukun figure they had just seen in Brussels (here) earlier that month. Another interesting pass was lot 35, an enigmatic statue from Cameroon, that failed to sell at an estimate of € 40-60K, unlike its pendant (illustrated in the catalogue) which had done well two sales ago. All in all, I think this was a very successful sale. Of course the listed sale prices include the buyers premium, which nowadays already is about 30 %. Adding the 10 % the consignors have to leave in Paris, it is clear that the true winner of this day was the auction house itself. Note that this is the second time I review a Christie’s sale on my blog – because it was definitely worth doing so – and I hope the new team (without Charles-Wesley Hourdé, but with Stanislas Gokelaere) will be able to create as interesting sales as this one in the near future. Concluding, I was very happy to notice the estimates were mostly on the low side. Working with estates (again a lot of objects from the Schwob estate) makes it possible to have such prudent estimations of course. It definitely helps to attract more interest – the Dan mask and the Pende pendant being the prime examples. If the estimate is right, the market can play – and that certainly happened numerous times this sale. Other times, the consignors have high expectations (cf. the Kota, or the Jukun statue), resulting in (too) high estimates. I think it is clear that in the end it’s always the market that decides. This entry was posted in Auctions on July 25, 2015 by admin. 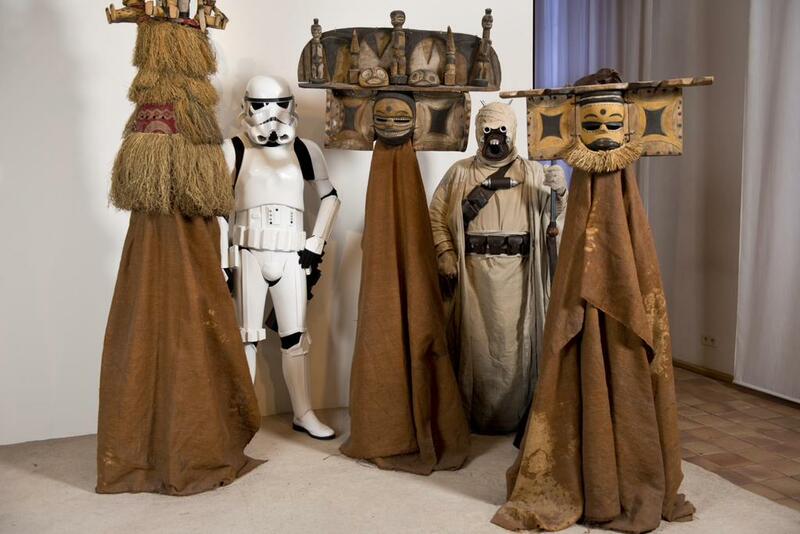 While African art had no influence on the costumes used in George Lucas’ Star Wars (as explained here), the props department did use wooden Fijian war clubs as an inspiration for the design of the weapon of one of its characters. 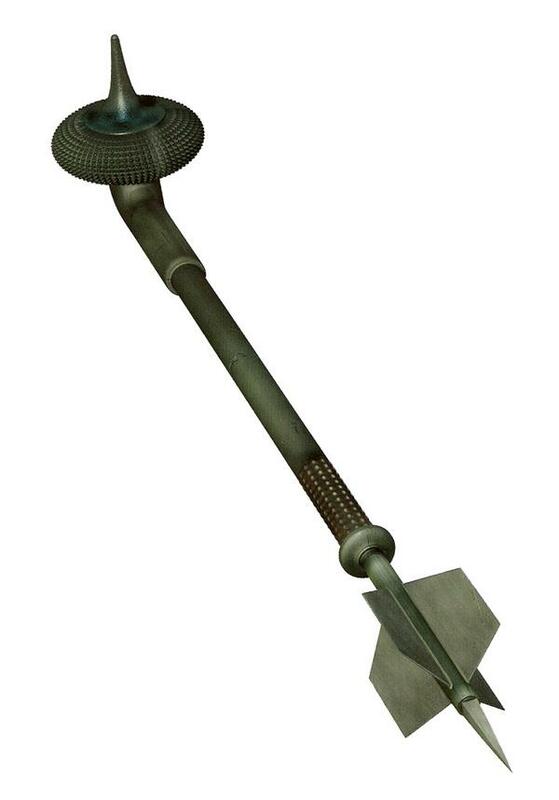 Gaderffii or gaffi stick used by the Tusken Raiders on Tatooine. 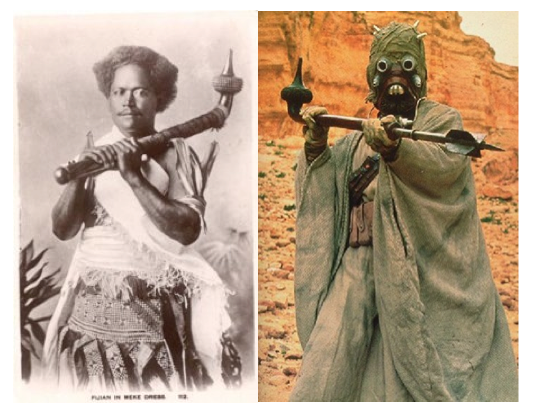 The handle of the gaffi stick, used by the Tusken Raiders on Tatooine, incorporates a full length Fijian totokia, and other versions incorporated other forms of long handled Fijian clubs – not surprisingly seen their fearsome appearance. According to Fiji material culture scholar Fergus Clunie who describes it as a beaked battle hammer (in Fijian Weapons and Warfare, 1977: p. 55), “…the totokia was intended to “peck” holes in skulls.” The weight of the head of the club was concentrated in the point of the beak of the weapon or kedi-toki (toki to peck; i toki: a bird’s beak). The totokia “…delivered a deadly blow in an abrupt but vicious stab, not requiring the wide swinging arc demanded by the others.” (Yalo i Viti. A Fiji Museum Catalogue, 1986: p. 185) It was a club that could be used in open warfare or to finish-off or execute warriors on the battlefield. 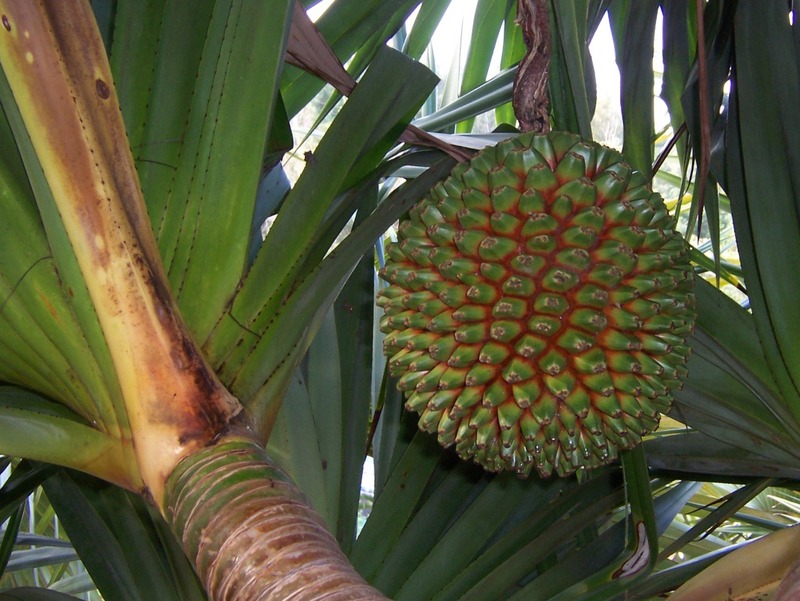 ps as you can see below, the large spiky head of the club references the fruit of the pandanus (and not the pineapple as is often erroneously stated). This entry was posted in Research on July 23, 2015 by admin. 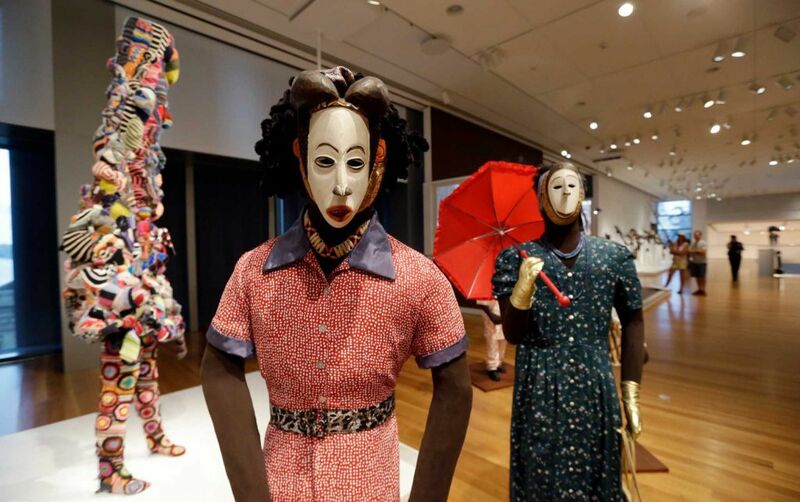 Installation view “Disguise: Masks & Global African Art” at the Seattle Art Museum. Image courtesy of Elaine Thompson, AP. The African art collector Sindika Dokolo gave an interesting interview to The New York Times here. Apparently he’s “on a crusade to force Western museums, art dealers and auction houses to return Africa’s art, particularly works that might have been removed illegally during the colonial era” – especially objects that were once in African museums (such as the Dundo Museum of Angola). To forward his cause, Mr. Dokolo’s foundation has set up a network of researchers and dealers (such as Didier Claes & Tao Kerefoff) to comb through archives and monitor the art market in search of stolen African art. Any time such artwork can be identified, Mr. Dokolo said, its owner will be offered a simple choice: Either sell him the work for the price at which it was acquired or face a lawsuit for theft. In Germany, there are plans to tighten the cultural protection legislation. As a reaction, the artist Georg Baselitz (an important collector of African art as well) has withdrawn all his loaned works from German Museums – read all about it here. A similar system already exists in France, the ‘droit de préemption’: each African art object sold for more than € 50,000 needs a permit and ‘passport’ before being allowed to leave the country. Also in France, Le Monde Afrique has taken note that African art is selling well these days – read the article here. Earlier this week, the Paris Musée Dapper announced their next exhibition (here). From 30 September 2015 to 17 July 2016, the museum will present its masterpieces in Chefs-d’oeuvre D’Afrique as a tribute to its founder, Michel Leveau (who died in 2012). Barbara Plankensteiner (formerly at the Vienna Weltmuseum) is becoming the new African art curator at Yale University’s Art Gallery. The creative output of Kongo artists of Central Africa will be represented by 134 works drawn from more than 50 institutional and private collections across Europe and the United States, reflecting five hundred years of encounters and shifting relations between European and Kongo leaders. From a dynamic assembly of 15 monumental power figures to elegantly carved ivories and finely woven textiles, the exhibition will explore how the talents of Central Africa’s most gifted artists were directed toward articulating a culturally distinct vernacular of power. From Frederick III’s Kunstkammer in Copenhagen, the Württemberg Kunstkammer in Stuttgart, the Holy Roman Emperor Rudolf II’s Prague Castle collections, the Royal Kunstkammer of King Frederick III of Denmark in Copenhagen, and Queen Christina of Sweden’s Royal Collection, Stockholm, there will be a selection of early ivory elephants never presented before in an exhibition. I’m happy to see the exhibition also got a hashtag: #KongoPower. At the Seattle Art Museum, the exhibition Disguise: Masks & Global African Art in the meantime is getting very positive reviews (here). The show will be traveling to Los Angeles and New York after Seattle. At the Saint Louis Art Museum, Senufo. Art and Identity in West Africa makes its second stop from 28 June to 27 September 2015. In New York, art experts don’t have to be afraid from potentially ruinous lawsuits anymore – read all about it here. The article concerns modern and contemporary Art, but I know of similar stories in the African art world too, so this is good news. In Belgium, Ostend’s Mu.ZEE has teamed up with the Royal Museum for Central Africa in Tervuren to create the exhibition European Ghosts – the representation of art from Africa in the twentieth century (info). Lastly, in London, Christie’s sold a Luba bowstand for a stunning $ 9,4 million – the second highest price ever paid at auction for an African art work! That, after already more than € 22 million was spend at the two sales in Paris last month (on which I still have to comment). As predicted, 2015 so far has proven to be a great year for African art. ps apologies for the lack of posts, my next book is eating up all my time. The Chokwe Tshibinda Ilunga figure from the Kimbel Art Museum. Image courtesy of Hughes Dubois, 1988. 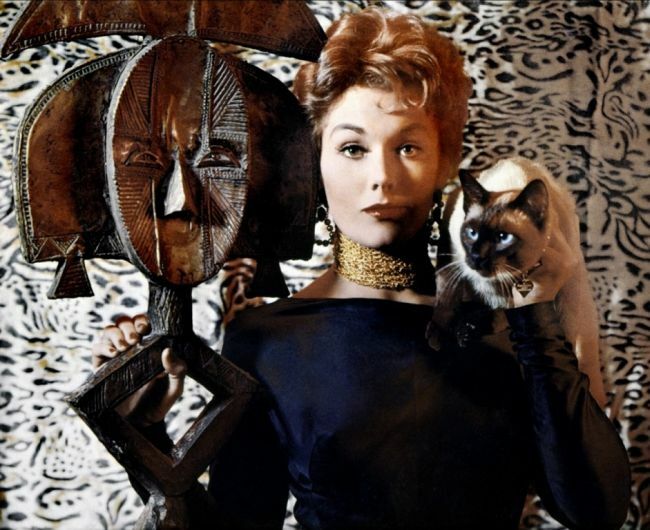 For their 2015 edition, the organization of Parcours des Mondes will present an exhibition about one of the best known photographers of African art: Hughes Dubois. It runs from Wednesday 9 September through Sunday 13 September, daily from 11AM to 6PM at 22, rue Visconti in Saint-Germain-des-Prés. For thirty-five years, Dubois has worked for the world’s leading museums, institutions, art galleries and private collectors all over the world, for whom he has taken more than 50,000 photographs, published for the most part in some 150 works. The exhibition will explore his work in an intimate way, and reveal a new side of his work. It begins with the first “North Sea” Polaroids, in which the young photographer offers a glimpse of his poetic vision of the landscapes of his childhood through a series of triptychs. The exhibition takes us then to the source of his professional work, with the presentation of 140 Polaroids of art objects. Until the American manufacturer ceased production of these mythical cameras in 2007, photographers used them to make test prints before taking their definitive shots. Dubois kept these Polaroids in meticulously annotated albums which today constitute the souvenirs of his archives, a selection of these Polaroids is shown here. They are arranged in thematic groupings which follow the photographer’s path, and become witnesses of a bygone practice now superseded by the digital age. Dubois’ personal projects were realized with his wife Caroline Leloup-Dubois, with whom he worked in close collaboration. Enthralled by the Buddhist temple of Borobodur on the island of Java, they would shoot photographs together, by the light of the full moon, of the bas-reliefs depicting the phases of Buddha’s life. Beginning in 2016, a traveling exhibition will present life-size prints of these shots, which will give the viewer the opportunity to experience the monumentality of the edifice, and to feel the very unique aesthetic emotion which the light of the full moon creates, and which Dubois so delicately captures. A print from this future show will be seen here as a preview. Detail of the Borobudur temple, Java. Image courtesy of Caroline Leloup & Hughes Dubois, 2014. This entry was posted in Exhibtions, News on July 3, 2015 by admin.